If you’re visiting Malta for only 5 days, you need to know what to see in Malta to truly grasp its essence in such a short time. You must visit some historical sites to understand Malta’s history, visit a beach or two and pop over to Gozo for the day to see the sister island. The main historical sites you absolutely cannot miss are the temples and Valletta. The Neolothic temples – locally called Hagar Qim are just 2km north of the village of Qrendi. These temples are over 3,600 years old and have been very well preserved. They are noteworthy, because they are built in honour of the goddess – the temple at Hagar Qim is a precise moon calendar, which can tell the days between each full moon, half-moons and quarter moons. It is said this was built purely as a place of worship and is truly a once-in-a-lifetime sight. These temples are older than Stonehenge and the Pyramids of Giza. The temples are also a UNESCO heritage site and will leave you in awe. The second most significant historical site to visit is Malta’s capital. Valletta was built by ‘gentlemen for gentlemen’ as you will often hear quoted. Planned and built by Jean Parisot de Valletta, it is a living museum of old auberges, historical museums and Palazzos. 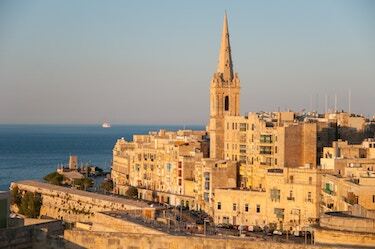 Just a half day spent walking around Valletta with perhaps a visit to the main museums there will give you a deep dive into the life of the Knights of Malta and the historically significant Great Siege of 1565. Valletta is also a great place to savour some of Malta’s best restaurants and boasts a handful of the finest high street brands you will find on the island. When in Malta you cannot forgo the opportunity to enjoy the sun and the sea. Even though you may not the bucket and spade type, there is a lot to enjoy here. There are many sandy beaches, most of them are busy, but there are also those that are more difficult to find if you prefer a quieter spot in the sun, especially around the north of Malta near Mellieha and St. Paul’s bay. If you don’t like lounging on sandy beaches and prefer to do something more exciting, you can book a day trip to Comino or go diving at one of the many diving schools on the island. Many hotspots will also offer a variety of water sports such as Jetski rental, parakiting, canoeing and water skiing. Malta will not strike you as a green place, especially if you come in the summer. This is why a visit to Gozo, the sister island is a must. Gozo is small and in one day, you can easily see most of it. So, visit the historical centre, taste the rustic food and enjoy the green hills and the beaches. If you’re only in Malta for a bit, make sure you create an itinerary that covers all these spots. The main thing you must look into if you’re only visiting for 5 days is how you will get around. You should have plenty of time to see all the spots mentioned if you hire a GoTo car, because you don’t need to add any waiting time between trips. Our cars can be booked 15 minutes before you need one and are available to pick up from the street in every town and village in Malta and hotspots in Gozo. More information on how GoTo cars work can be found here. We have you sorted because all the places we mentioned above come with reserved GoTo parking and one or more of our car sharing electric cars are on stand by – waiting for you to book and drive. See what matters in just 5 days with GoTo – register online before you arrive to buy one of our prepaid bundles.